We were established in 1994 and now we are one of the main players in producing welded steel structures on the market. High quality, readiness, high production capacity and the ability to be flexible when required, have helped us grow and maintain high expectation in the field. Our manufacturing plant in Caransebes has approximately 60 highly experienced employees assisted by specialized engineers and can deliver up to 5000 tons of welded steel structures per year. The production of steel structure components is made in compliance with the highest technical and quality standards in force, supplemented by special requirements of designers and clients. We have an in-house international welding engineer, certified staff and equipment for the nondesctructive testing of weldings (VP, LP, MT, US). 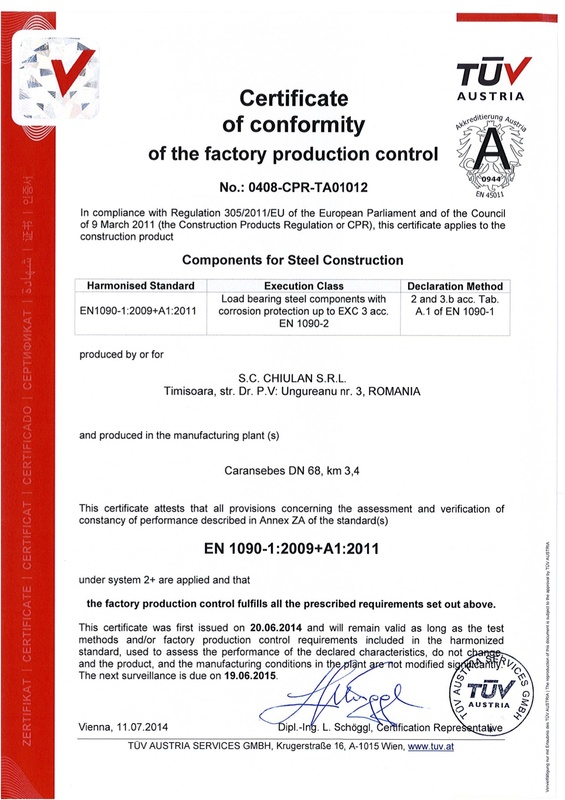 For scheduling and supervising we use SteelTrack, a custom software developed by us on iOS platform. With this software, our clients can always know, in real time, the exact stage of production of any assembly of the order. We use Tekla Structures, the most advanced software on the market for modeling and drafting our customers projects. Even if our customer does not want the option of drafting, we still do it for special projects so we can discover the designer’s faults and provide correct CNC files to the workshop. 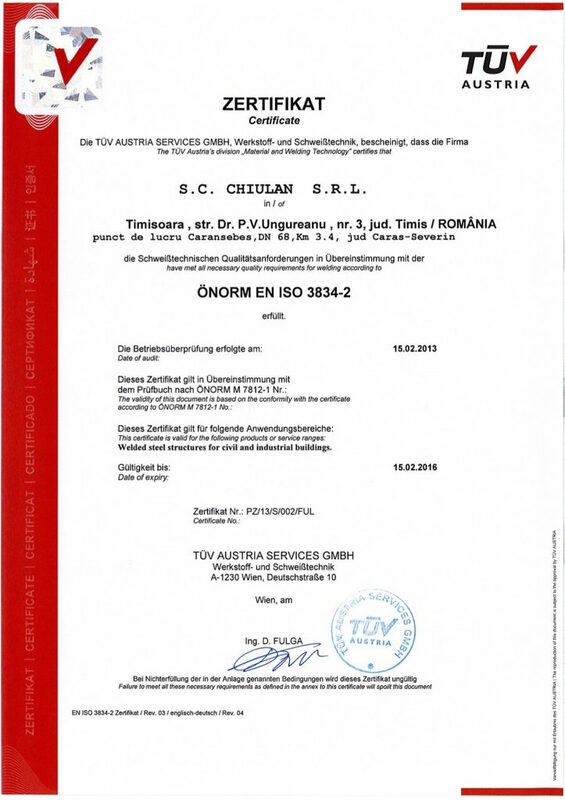 The Company maintains an integrated management system for quality, environment and health and safety (ISO9001, 140001, 18001), certified by TUV CERT Austria. 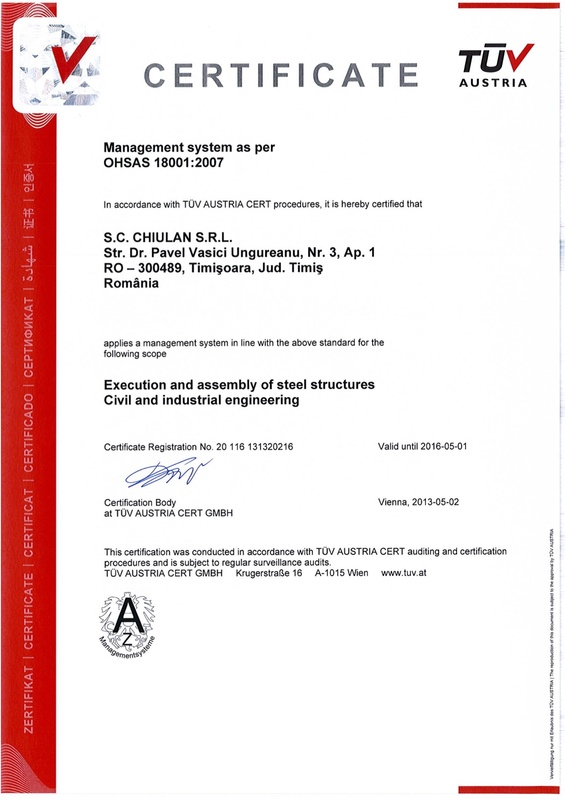 The company also has approved welding procedures and all the welders are certified by TUV CERT Austria. We were certified by TUV Austria for the factory production of the steel structures according to EN 1090-2, EXC3 class.